Editor’s Note: This article originally appeared a few days ago on the corporate blog of Moss Architecture and Planning studio in North Center as “Spooky Architectre: Cities of the Dead.” In the spirit of Halloween, we’re ghosting it here for you to enjoy. No compensation changed hands. We just thought it was a good read. Today young and old alike will take part in a holiday as American as apple pie—oh wait, we mean as Irish as Shepherd’s pie and as Roman as a Fraternity. Halloween, a holiday that from its inception has been tied to the spiritual, supernatural and undead, is as inseparable from spooky cemeteries as a child from a pillowcase full of candy corn. Both have a rich history, well woven into architecture and urban planning, before becoming the American institutions we know today. The Cemetery: spooky, somber and certainly no place anyone would want to gather for a picnic, right? Actually, the cemetery was once barely distinguishable from the public park of today, replete with screaming toddlers and neighborhood barbeques (or whatever Puritans did for fun—like blaming food poisoning on witchcraft). The American cemetery has had an interesting trajectory: from recreational milieu to something grim, ghastly, and almost synonymous with October 31st. As a matter of fact, we’d be hard pressed to find a Halloween movie that doesn’t have some poor soul dodging around a house sited on an “old indian burial ground” or tiptoeing through a cemetery, doubtlessly about to have her brain feasted on by zombie/vampire/werewolf/#trendychildoftheunderworld. Today we’ll explore the cemeteries past and present in a global context, by looking at some of the world’s approaches to dealing with the dead, from France to Cahokia and back to Chicago, as well as what modern design practices take cues from this past. Next time you soak up some sunshine in Millennium Park, consider this: the sprawling, green and bench-bedecked public park owes its origins to the modern American cemetery. Maybe you should run screaming instead? Before 1831, most American burials occurred in the local churchyard, but as urban populations grew (and with them, the populations of the dead) fears compounded about the spread of disease given the close proximity of overstuffed grave plots to everyday life. Dr. Jacob Bigelow, a Harvard professor and doctor, came up with the idea to relocate family burial plots outside of the city, and together with a band of civic leaders, he founded the very first “rural” Cemetery: Mount Auburn in Cambridge, MA. Still fully operational today, Mount Auburn was established on a 72-acre farm on, what was then, the outskirts of Cambridge and Watertown, which Bigelow selected not only for its breadth, but for its 125-ft hill which provided gorgeous views of Boston and Cambridge. This hill is now home to the Washington Tower, whose Rapunzel-esque charm is rendered in gothic windows, a winding stone staircase and battlements (spaced parapets intended to allow soldiers to surreptitiously fire their cannons). The sprawling cemetery is the resting place of nearly 100,000, including famous poet and doctor Oliver Wendell Holmes. Mount Auburn was dreamed up not just as a solemn graveyard, but as a place for recreation, communion with nature and a stage for wildlife and exotic plants. This dream was realized when Massachusetts Horticultural Society President Henry S. Dearborn took the reigns on most of the design. Influenced by European cemeteries and English Landscape Gardens, which emulated (and tried to improve on) rural landscapes of rolling hills, winding footpaths and agrarian life, Dearborn aimed to bring a space of romantic natural beauty to the American public. Before long, other rural cemeteries, like Greenwood Cemetery in Brooklyn, were popping up around city limits all over the country. Mount Auburn continues to honor land conservancy today, with an active community of birds and birdwatchers, and a year-round tended exhibition of flora. The same principles which inspired the first rural cemetery—recreational, natural space; land conserved from development—spurred movements for the first public parks, and culminated in the iconic Central Park in New York, designed by prolific landscape architect Frederick Law Olmsted, a huge advocate of tranquilizing natural “scenery”, especially in the context of urban space. In “Olmstead—His Essential Theory,” Charles E. Beveridge summarizes Olmstead’s attitude toward green space: “…Scenery, [Olmstead] decided, worked by an unconscious process to produce relaxing and “unbending” of faculties made tense by the strain noise and artificial surroundings of urban life.” One of Olmstead’s biggest influences was Andrew Jackson Downing, a prominent advocate for public parks for reasons both aesthetic and democratic—Jackson believed strongly in a green space that could be enjoyed by all classes of society. Cemeteries, and later the public parks which now dot American cities allowed the public to enjoy nature, sculptures and events, previously only available to the wealthy who owned private land. Grave sites were originally tended by visiting family members but eventually plot maintenance shifted from the bereaved to cemetery staff who were naturally interested in a more efficient system. The now-typical “lawn plan system” was proposed in 1855 by superintendent Adolph Straunch, working at Spring Grove Cemetery in Cincinnati. It emphasized uniformity and unbroken lawn space, which allowed for full-time cemetery care staff to efficiently maintain large swaths of land. The ground needed to be level to permit machines to mow and maintain these lawns on a large scale, so grave markers were pared down in height and design. By 1900, the more naturalistic and rural approach to cemeteries was supplanted with buildings and landscapes absent of ornamentation. This spare approach is present in most contemporary cemeteries and public parks alike. We’ve covered the history of the cemetery in America, but other societies around the world have been approaching storage of the dead in different ways since the dawn of humanity. Differing on matters of philosophy and religion, cultures have carved monuments, interred in earth and even moved below boulevards. While these are just a fraction of the methods in which people have sought to honor the dead, each has a fascinating history and continuity in some element of modern design. Like parks, tombs and mausoleums (freestanding buildings with or without burial chambers) provide an interactive space for the public (now) to honor the past through living history. The design of a mausoleum records not only the popular architectural style at the time of construction, but also reflects the preferences of the person interred there. Indian emperor Humayun, for example, gave his favorite barber a special tomb within his royal mausoleum—the only one of its kind in the entire 300 ft wide structure and among the over 150 people buried there (many of whom were immediate or extended family.) That guy must have given really good haircuts. Although lesser known than the Taj Mahal, Humayun’s tomb is significant because it was the first distinctly Mughal building, an architectural style which combined Persian, Islamic and Rajasthani influences to form a distinctive aesthetic. The Taj Mahal, built some 60 years later, is considered to be the finest example of Mughal architecture in all of India. Mughal architecture represented a shift toward more organic and curving shapes and lines, including domes, arches and minarets heavily present in Islamic architecture, which was a contrast to the beam and pillar-heavy linearity that prevailed prior. The Mughal style was born in India because Emperor Humayun lost his throne and drifted around Iran for some 15 years. When he returned, he brought with him additional influences from Persia, including the traditional Persian garden, or Char Baah, which made his tomb India’s first garden tomb. This style of garden is divided into four parts with paths that conjoin at the garden’s center. It was Humayun’s father who first brought about the tradition and ideal of being buried in a “paradise garden,” although his tomb was much more spare than his son’s. He may not have meant his burial place to become a beautiful tourist spot … but that fact remains that it now is one. The inhabitants of Cahokia, the most advanced Mississippian city, also constructed stunning monuments for the dead, with the aim to convey stories as they passed into the afterlife. The some 12,000 people who lived in Cahokia in 1150 CE were the producers of an incredible array of earthen mounds, (“packed earth pyramids,” according to Timothy R. Pauketat, author of Cahokia: Ancient America’s Great City on the Mississippi). The mounds served a variety of purposes: some as temple grounds and many as burial chambers. These burial sites were absolutely central to the community. Unlike Mount Auburn, shunted off to the edge of civilization, they were essentially the center of the town square … and dotted throughout the urban landscape. One excavated mound contained a single man lain to rest over 25,000 marine shell beads, arranged in the shape of a falcon. Archaeologists assume that he was a man of royal or elite status. Another mound contains 24 young women, assumed to be village people used for mass sacrifice. Yet another contains several men that have been beheaded and had their hands removed. Although Cahokia is the most famous site for its earthen mounds, these structures can be traced back to the Hopewell Indians, way before Cahokia was established. The architecture of the Cahokia mounds, especially for a society with so little technology, is truly impressive. The city itself is built 5 degrees off cardinal (True North), an angle recently discovered to correspond with a moon cycle that occurs every 18.6 years, explains Professor Pauketat. Even the bodies within the burial mounds are oriented to that alignment. Monk’s Mound, one of the site’s most famous, is the largest earthen mound not just in Cahokia, but in all of North America. The mound measures an incredible ¼ mile from the Northern to Southern end. Beyond its size, another interesting feature of Monk’s Mound is its flat top. Ridge-top mounds, the type associated with burials, were special occasion monuments to either people of great import, or mass sacrifices, which appeared to have been a unifying event within the city’s life, possibly to retell creation stories. In this sense, although no happy fate for its captives, death and burial was a prominent part of Cahokia’s culture, and not the least bit hushed or enshrouded in mystery. Around the 17th century, the most romantic city on earth found itself with a not-so-seductive problem: endless cycles of poets, painters and everyday Jéan-schmos had overstuffed its cemeteries and churchyards, which were buckling at the seams. Residents began to complain: dead bodies were bursting forth from the soft earth and tumbling into neighboring buildings on rainy days; Parfumeries urged someone to do something; sales were dragging because not even the precursor to Chanel No. 5 could mask the stench of rotting corpses. Under the direction of King Louis XIV, The Quarry Inspection Department came up with a rather brilliant solution: out of sight, out of mind! He commanded the displaced dead bodies to be moved into miles of tunnels below Paris, the location of former limestone quarries from which the very walls of the city had been built. At the time of the last burial in the catacombs, over 6 million Parisian bones were artfully displayed along the tunnel walls. The entire process took 12 years. People can currently visit the catacombs legally, taking a rather creepy tour of the underbelly of the city—but many (known as Cataphiles) also visit it illegally, holding raves and painting murals in the catacomb’s restricted areas. Although the catacombs may have solved one problem in Paris during the 18th and 19th centuries, it soon became apparent that they were part of another: the cavernous tunnels that make up the substrata of Paris were created by quarrying out the limestone for the city’s buildings. Now, however, they prevent the city from erecting any buildings over 10 stories high. The approximately 300 kilometers (186 miles) of quarries that snake below the city’s 5th, 6th, 8th, 12th, 13th, 14th, 15th, 16th and 20th Arrondissements (districts) make it too risky to build deep enough foundations to sustain anything even close to a skyscraper. To illustrate, the 108-story Sears Tower (ahem) has a foundation of 100 feet deep. Although the entire network of tunnels under Paris are referred to colloquially as “the catacombs” not all of them are plastered with bones of the city’s long dead. The particular area most people mean when they refer to these ossuaries runs underneath the 14th arrondissement of Paris, flanking the famed Montparnasse neighborhood where writers and artists like Henry Miller drank one cup of coffee without tipping swilled cappuccinos in the 1920s and 30s. These tunnels have caused catastrophic collapses in the past. In 1879, six streets and a soccer field collapsed into a chalk quarry in the Parisian suburbs, killing 21 people. Despite the advancing of the years, such collapses are not all that rare. It’s estimated about 10 streets crack annually, revealing the city’s honeycomb-like underside. Speaking of bones and buildings, here’s one way not to do things: The legacy of the Chicago City Cemetery haunts the baseball diamonds and marshes of Lincoln Park all the way up to present day. Established in the 1840s, the Chicago City Cemetery was a large burial ground built on the far edge of the City, stretching from beyond North Avenue to the southernmost point of Lincoln Park Zoo. Unfortunately for those attempting to rest in peace in the Chicago City Cemetery, no such thing was to take place. The soil quality was extremely poor, so bodies were constantly shifting around, even making cameos in Lake Michigan, much to the chagrin of sunbathers. In 1866, over fear of disease and contamination given the cemeteries proximity to the Lake, it was declared illegal to bury any additional bodies there, and the ones that remained were to be dug up and relocated elsewhere. Of course, in typical Chicago fashion, both a lack of money and general corruption prevented this from happening, and many of the unfortunate corpses were forgotten. 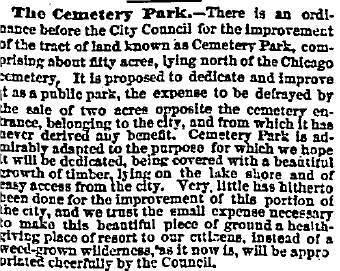 To make matters worse, as the property value of Lincoln Park soared, someone decided the cemetery would be a great place for a public park (although Olmstead would have applauded). Even today, it’s not uncommon to run into the odd femur. In Kyla Gardner’s 2013 article entitled “Human Bones Uncovered During Construction Reveal Gold Coast’s Haunting Past,” researcher Pamela Bannos said, “It’s almost safe to say that if you dig on Dearborn or State Street you’ll find something.” Bannos is the founder of comprehensive website Hidden Truths, which maps the history of the Chicago City Cemetary. While working on a construction site last year, Gardner reported that worker Gerardo Munoz found, ‘Human bones— it was the ribs and the leg bones’ just 6 inches below the soil. Cemeteries have a compelling history, transforming from unsanitary resting places to picturesque parks, before settling into plain, landscaped lawns, losing not a few bones along the way in the move. Knowing this, we may never look at those subterranean skeleton decorations in quite in the same way again. As quintessential as the American cemetery has become to Halloween, it actually may not be the most elegant solution for dealing with our dearly departed ones, especially in its current common form. Cemeteries take up a lot of single-purposed space—typically behind a guardhouse and 10’ walls—and are smothered in irrigated turf lawns. The cemetery of uniformly sized-headstones on flat ground represents a recent paradigm shift, bowing to the mechanization of cemetery care rather than any aesthetic or human consideration. Vault burials, a standard practice in American funerals typically involve embalming the body, which involves large amounts of the preservative formaldehyde, a declared carcinogen. Embalming started around the Civil War, when bodies needed to be preserved for transportation home, but in local cases, the process is completely optional. In an Oct. 08 interview with Fresh Air, Caitlin Doughty, a mortician and advocate for natural burial, told host Terry Gross “my personal opinion is that we should be moving towards not embalming unless it’s absolutely necessary because it is a chemical process and it can be an expensive process for the family.” As with any ecosystem “what goes around, comes back around” and Formaldehyde in the ground means it eventually trickles into our drinking water. The modern perpetual care cemetery is neither pleasant to roam like Mount Auburn; stunning or historically significant like Humayun’s Tomb, efficient like the Catacombs; nor is it an especially brilliant or sustainable use of space in an urban environment. These days ideas about how to store and memorialize human remains are changing (sometimes drastically). In Sweden, you can get composted. The Swedes siphon all the liquids from a corpse, freeze dry it, and shatter it, making some lovely fodder for your spring Begonias. You can also be transformed into an everyday object—like a record or a box of 240 pencils—causing us to wax philosophical about where the line is drawn between inanimate object and a formerly-animate object. You can also be compressed into a diamond…or become a habitat for feeding fish in the form of an eternal reef. These ideas are interesting, but we don’t think that the traditional burial will ever go the way of the dodo. An earth-bound burial is customary for reasons both philosophical, cultural, and religious for thousands of years; it provides people a tangible ritual to help them acknowledge the ephemeral nature of life. In that vein, a group of land conservationists have combined environmental interests with the age old practice of returning people to the soil. Conservation burial grounds, as they are officially known, are essentially a cross between a cemetery and a nature preserve, combining land, wildlife and plant stewardship with a functional and vivacious space to both inter the dead and commune with nature. Freddie Johnson, former fitness and health professional, founded the Prairie Creek Conservation Cemetery in Gainesville, FL, with a few dedicated friends in 2010 after feeling frustrated with his own death care options. Johnson, who harbored a lifelong passion for land conservation felt that the usual options available to Americans—vault burial or cremation—caused harm to the environment and truncated the grieving process by separating death care from the family in mourning. Conservation burial grounds are unique in that they must be contiguous with an already existing land trust, essentially packaging on additional land for burial purposes that will also receive protection from corporate development. Conservation burial grounds must propose a plan to care for plants and animals so as not to make a net negative impact. In order to do this effectively, it is legally required for the groundskeepers to conduct a biological evaluation on geology, hydrology, soils, and topography, and on both existing and potential vegetation and wildlife. It must be ensured that native species of plant and animal life will be able to be either introduced or continue to exist when the burial ground is complete. Designers must also have plans for protecting rare plant species, as well as minimizing erosion, among other precautions. Instead of vaults, many of the deceased are buried in the ground, sans covering. Prairie Creek does allow vaults, but they must be made of a biodegradable material without hazardous chemical additions. Advocates of the Conservation burial method revive the spirit of Mount Auburn, in that the resting place of the dead becomes a place for the living to honor their loved ones, while making new memories of their own in a beautiful, natural green space. Perhaps the best element about Prairie Creek, and what truly separates it from most cemeteries we see in the city is its functionality and integration with everyday life. “What natural burial sort of brings with it, is it automatically is saving and managing a wonderful ecosystem and creating a passive recreation place for the living and it’s also silently and beautifully filtering air and water for the community,” Johnson says. At Prairie Creek, and other conservation burial grounds, individual plots might not be as obvious to the eye as in a traditional cemetery. The entire space becomes communal— much more like a public park—although there are trail maps indicating where the individual plots are. For Chicago and other American cities, we propose teaming up with some nature preserves, like the North Park Village Nature Center, and transforming a portion into conservation burial grounds. Prairie grasses, like the ones maintained at Winnemac Park, would especially lend themselves to this practice; unlike dense forests, there would be visibility and ease of navigation late at night. In addition to conservation cemeteries, we can take cues from the Catacombs, and gorgeous structures like Humayun’s Tomb; a monument to the dead can become a space that is both interactive and integrated in daily life, serving as a record and learning tool for history, art and design, while also honoring those interred there. Memorial Gardens, like the one in Cocoran, MN offer display plaques, benches and bricks the bereaved can dedicate to loved ones. Adjacent garden space allows for families to scatter ashes among gardens and favorite flowers. The dead can also be remembered, individually or in groups with cenotaph,tombs without any remains in them, interspersed with urban areas. This practice dates back to the ancient Egyptians. They can be anything from simple, like the Hawthorn’s Memorial, to elaborate, like the Bada Bagh Cenotaph. Cenotaph and monuments alike offer tidbits of tranquility and thoughtfulness that fold in seamlessly with the rhythm of routine, yet add nuanced character to any cityscape. Downtown Chicago has a bevy of nooks and crannies which make perfect candidates for these markers. Although the Mt. Auburn style park-cemetery design is no longer with us (pun intended), we appreciate the sentiment: integration into everyday life by being an additional green space in which to walk, think, reflect and keep memories of our loved ones interwoven into our daily lives. We can learn from the architecture and urban planning of burial in the past, to make the cemetery something that contributes to and evolves with the living, while honoring our memories of the dead. As weird as it sounds today, public parks are the grandchildren of rural cemeteries. Both reflect an egalitarian attitude and the notion that green space deeply benefits cities, and that those benefits shouldn’t be restricted to the upper class. Conservation cemeteries like Prairie Creek restore this attitude, not just in the sense that they promote land stewardship for access by all, but in that they actively seek to care for our public goods, things that should be an inalienable right no matter your annual income, like clean air, water, and dirt in which to grow our food. Maybe cemeteries don’t have to be so spooky after all. Don’t worry, Halloween, we’ll always have candy corn. Emily Torem is a Logan Square writer and freelance illustrator with a passion for environmental and food politics. She writes for Moss Architecture and Planning studio, and illustrates over at Paul Dailing's 1,001 Chicago Afternoons. She also works at Wicker Park Inn as an Innkeeper.